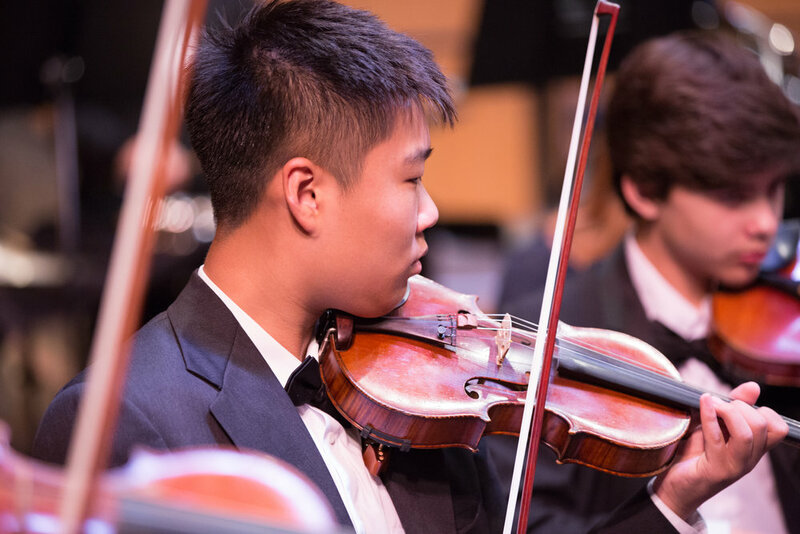 AYPO consists of five separate orchestras — the Debut Orchestra, String Ensemble, Concert Orchestra, Symphonic Orchestra, and Philharmonic — and instrumental ensembles. Each orchestra rehearses on Monday evenings from September through May and performs at least three times during the year. Learn more about each orchestra and ensemble below. Our most advanced orchestra, the American Youth Philharmonic (AYP) is a musical training ground for the most accomplished young musicians in the area, many of whom go on to have successful music careers. AYP performs a series of demanding orchestral literature spanning from Classical to contemporary and commissioned works. Typically includes students grades 9th-12th, averaging grade 11. The American Youth Symphonic Orchestra (AYSO) is a full orchestral ensemble with a focus on musical and leadership development. Repertoire is carefully selected to give both brass and woodwind players solo opportunities, with an emphasis on classical masterpieces that are important for any young player’s musical education. Typically includes students grades 8th-12th, averaging grade 10. The American Youth Concert Orchestra (AYCO) is the first full orchestral ensemble that a musician experiences within the AYPO program. The wide variety of concert repertoire is meant to challenge and educate musicians by exposing them to new styles and techniques. Strong emphasis is placed on training young woodwind, brass and percussion players in the art of orchestral playing. Typically includes students grades 7th-10th, averaging grade 9. The American Youth String Ensemble (AYSE) is an intermediate string orchestra for musicians at a comparative level of Suzuki Book 4 or above. An emphasis is placed on understanding the roles and relationships between instruments in the ensemble. Repertoire is chosen from diverse parts of the world to expose the players to different playing techniques. AYSE performs both original string orchestra works and arrangements of standard symphonic literature. Typically includes students grades 5th-8th, averaging grade 7. AYPO’s youngest ensemble, the American Youth Debut Orchestra (AYDO), has grown significantly in just four years! AYDO creates a fun and focused environment where string players learn the fundamentals of orchestral performance, vital rhythmic and tempo techniques, and overall basic ensemble playing skills. AYDO focuses on the growth and development of musicians at the beginning of their orchestral training. Before joining, musicians should have at least two years of private instruction. Typically includes students grades 2nd-7th, averaging grade 5. The American Youth Percussion Ensemble is comprised of percussionists from all orchestra’s. Under the leadership of Doug Wallace, the Percussion Ensemble has become its own community within the AYPO organization. Percussion Ensemble members play for their aforementioned orchestras, but also rehearse independently to prepare for their own concert in the spring. The Percussion Ensemble has gained national acclaim through its two performances at the Music for All National Festival in Indianapolis, IN in 2012 and 2015. The Flute Ensemble rehearses weekly on Mondays at Kilmer Middle School and performs several times a season. Its repertoire includes arrangements for flute ensemble as well as original works. Flute Ensemble is open both to current AYPO members and non-members. Under the expert direction of Elizabeth Blakeslee, the Harp Ensemble rehearses weekly on Monday evenings. Its repertoire will include arrangements for harp ensemble as well as original works. Any harpist who has had at least one year of private instruction and plays on an instrument with a minimum of 34 strings with a full set of levers is invited to audition. The Clarinet Ensemble rehearses weekly on Mondays at Kilmer Middle School and performs several times a season. Its repertoire includes arrangements for clarinet ensemble as well as original works. Clarinet Ensemble is open both to current AYPO members and non-members. The Chamber Ensemble Program is for talented musicians who participate in either AYSO or AYP. Ensembles are formed based on the applicant's video audition, orchestra, and instrument, at the discretion of the artistic and administrative staff. The ensemble instrumentations vary depending on repertoire that includes a mix of strings, woodwinds, brass, harp, and piano. The program gives musicians the opportunity to enhance their musical development by studying and performing chamber music under the guidance of professional instructors. The Junior Chamber Ensemble Program, lead by String Coach, Tsuna Sakamoto, is comprised of talented young musicians who participate in either AYCO or AYSE. This program provides young musicians with the opportunity to perform and learn about beginning concepts and techniques involved in performing chamber music.